Some of the road signs that greeted the first lady's motorcade referred to tensions between her goodwill tour and her husband's policies. LILONGWE, Malawi — Dancing school children. Old men beating on goat-skinned drums. A frayed red carpet on the baking African tarmac. 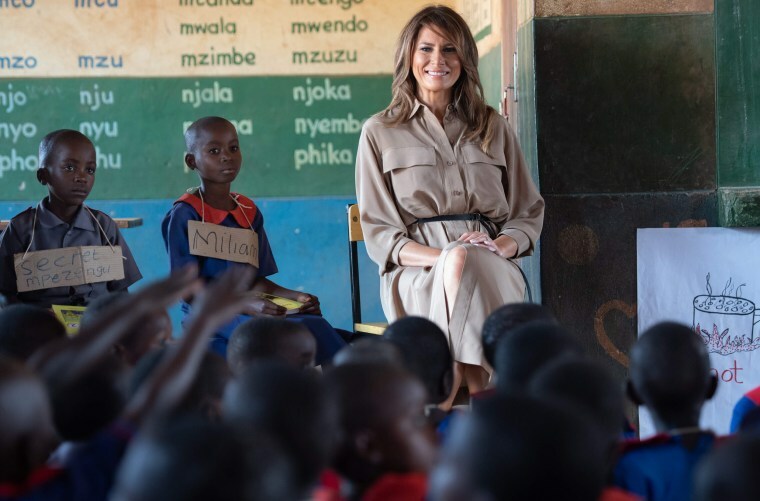 First lady Melania Trump's arrival in Lilongwe, Malawi, the second stop on her four-country African tour, had all the pageantry of a presidential visit to Africa, but none of the crowds. "Malawi and America are united," sang several dozen children in Chichewa, the local language, somehow not breaking a sweat in their uniform sweaters under the midday sun. Absent were the fawning crowds that greeted President Barack Obama and his wife, Michelle, on their first visit in 2009. Missing were the billboards that lined the airport road in Dar es Salaam, when President George W. Bush visited Tanzania in 2008. Part of Melania Trump's reserved welcome was due to the trip's secrecy. Two days before she landed in Lilongwe, many residents were in the dark about her impending visit. And it wasn't because the power cuts out for five or six hours a day. The embassy didn't announce a precise arrive date until the day before her plane touched down. But among those who had heard, there was a sense of excitement, mixed with pride, about a visit from the first lady and former fashion model. "We want to welcome her," said Veronica Muz, a local journalist. "And I definitely want to know what shoes she is wearing." For the record, she descended the steps of her plane in heels, but was wearing flats by the time she walked across a school's duty courtyard on her first stop. It was a public school, where some 8,554 students share 77 teachers and 22 indoor classrooms. A factsheet produced by White House advance team did the brutal math: That's a 111:1 student to teacher ratio. "Thank you for having me here and for the beautiful welcome," Mrs. Trump told students and teachers. "I wanted to see a successful program that the United States is providing for children." The Chipala Primary School, made of homemade bricks and lit only by natural light, was little more than a cluster of buildings around a central courtyard. "We have 15 outdoor classrooms," said Maureen Masie, the head teacher, in an interview. "The biggest class is 318 pupils." When it rains, those outdoor classes get dismissed. "It makes it very difficult for our teachers to finish their syllabus," she said. "For us to have the first lady, it's really a great honor," she added. "And we feel that some of the things are going to change at our school." A poor education system is one reason why women leave school too soon and have babies too early. That leads to a pregnancy rate of roughly 40 percent among 15-19 year olds, according to the United Nations. More than 70 percent of the population lives on less than $2 a day. The power grid is temperamental. Most grocery stores, hotels and restaurants have back-up generators. Across the street from the school, carpenters chiseled furniture by hand, working under the hot sun, not a power tool in sight. During the height of the HIV/AIDS crisis, there was brisk business for coffins. When Mrs. Trump left the school, children crowded around reporters, asking for discarded water bottles. Nothing goes to waste in this part of the world. Along the road, workers cut bald tires into strips, repurposing them into flip-flops, for those who could afford them. "Meeting those children and understanding their different way of life is why I wanted to travel here," the first lady later said at the embassy. But she made no mention that her husband has threatened cutting funds for the kinds of book-buying programs that she was in the country to celebrate. The tension between Mrs. Trump's goodwill tour and her husband's policies hung over the trip, and was referred to in some of the road signs that greeted her motorcade. Some Malawians wanted to see the president himself, on African soil, offer an apology for reportedly referring to African counties as "s---holes." "I'd rather have President Trump come and make up for himself," said Daniel Mababa, the editor at Zodiak radio, the county's leading news radio station. Those insulting comments ricocheted across social media in Africa and will have a lasting impact, Mababa said. "I would like to think that the relations have not been broken in any way," Mababa said. "But maybe it's just the attitude that has changed — the attitudes of Africans towards Americans." Upon Melania Trump's arrival, the minister of information, Nicholas Dausi, could hardly contain his excitement, exhorting the press to report positive stories. "Write good news," said Dausi.